These boots are in a good used condition. • block heel biker style boots. Scratches around and to the inner side close to the heels photo #12. The Actual colour of this item may vary slightly from the images/photos I’ve provided. And apologies for the colour inconsistency this is due to lighting and other factors while taking the photos! ladies brown biker - style boots studs, chains size 4. Condition is good and Used. Dispatched with Royal Mail 2nd Class. Ladies New Rock boots, size 39.5/7, used, good condition. Leather, heavy goth, rock, original boots. Lovely, brown, leather, biker style boots by CATERPILLAR. Cream Fur/fleece lined. Great quality boots. Size 8 (Wide fit). Good used condition. Ladies Black Leather Ankle Boots from Next Biker Style VGC only worn twice. Condition is Used. Dispatched with Royal Mail 2nd Class. Ladies Motorbike Boots by PREXPORT. Short boot style, with protection to the front and rear above the ankle. WE BOUGHT THESE BOOTS IN THE USA ABOUT 5 YEARS AGO. MY WIFE HAS NEVER WORN THEM APART FRM ONCE IN THE HOUSE WHEN SHE DECIDED THEY WERE TOO SMALL. THE SIZING IS QUITE SMALL SO THE MAY FIT A SIZE 7. UK SIZE 11 ONLY WORN ONCE OUTSIDE THE HOUSE. Destroy Boots Size 37( 4 Uk ) Lovely Comfy Boots Zip Up Boot Buckle Fea. Condition is Used. Dispatched with Royal Mail 2nd Class. Aldo real leather Black Bikers Ankle Boots quilted on the back Size 7 Good Condition. Sturdy heel - 2.25 " / 6 cm. great condition with minimal signs of use - scuffs / scratches that add much character to genuine leather. Ladies Irregular Choice Black Knee high boots size 4 worn twice. Ladies Irregular Choice Black Tall boots size 4. Condition is Used but only worn twice so like new. Lining is beautiful red quilted velvet which you can see if you turn the tops down see photos. Lovely and comfortable but ive put weight on so my legs are a bit snug now. Downsizing so listing all my possessions. From smoke and pet free home. Dispatched with Royal Mail 2nd Class. New Rock high platform punk boots, black ,size 4,used, goth/biker style . Condition is Used. Dispatched with Royal Mail 2nd Class.has some scratches. 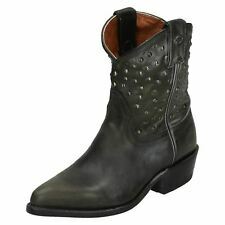 VINCE Black moto boots EUR 37.5. Condition is Used. Dispatched with Royal Mail 2nd Class. Ladies Cat Boots size 5. Condition is Used. Had them re-sold as I’ve had these darlings for two decades which make them vintage, still looking and wearing fab but not so much the owner. I would keep forever, but time to let other journeys make boot prints Dispatched with Royal Mail 2nd Class. In a rich brown leather upper that gives them a premium feel, their lace up design adds to their laid back silhouette, while the cleated sole gives them a better grip in wet conditions - perfect for what the weather's doing right now! Ladies brand new biker boots! size 6, any takers? Black, comfy, chunky heels, selling as they are slightly too small for me, only tried on once. Condition is New with box. Dispatched with Royal Mail 2nd Class. river island boots size 6. Condition is Used. Dispatched with Royal Mail Signed For® 2nd Class. River Island Size 6 Stud Boots . Dispatched with Royal Mail 2nd Class. Rocket Dog Women's Sadler Biker Boots, (Roast Brown), 7 UK /40 EU OVER £50 OFF! Rocket Dog Women's Black Buckle Long Mid Calf Zip Up Casual Boots Shoes Size 6. Condition is Used. Dispatched with Royal Mail 2nd Class. LORIBLU boots. Superb chunky ankle boots in quality pebbled leather and very comfortable on the foot. Heel height off set by the 1in front platform. Great anti slip rugged soles. Dr Martens Kristy Biker Boots Size 6.5. Bought these off eBay only the other week but they’re too big. Not worn a great deal by the looks of it, and a really nice style biker boot, personally I would say they are more a size 7 than a 6.5 but I don’t know how other Dr Martens come up? I will despatch by first class post or next day courier, any questions please ask. • block heel biker style boots. • slip on inner zip for closures. The Actual colour of this item may vary slightly from the images/photos I’ve provided. And apologies for the colour inconsistency this is due to lighting and other factors while taking the photos! Ladies Black Biker Boots Size 7. Dispatched with Royal Mail 2nd Class.